TORONTO, December 4, 2014 – Toronto Real Estate Board President Paul Etherington announced that Greater Toronto REALTORS® reported 6,519 residential transactions through the TorontoMLS system in November 2014. This result was up by 2.6 per cent compared to 6,354 sales reported in November 2013. Through the first 11 months of 2014, total sales amounted to 88,462 - up 6.6 per cent compared to the same period in 2013.
accepted lending standards. This is coupled with the fact that housing has proven to be a quality long-term investment," stated Mr. Etherington. The average selling price for November transactions was up by 7.4 per cent year-over-year to $577,936. The year-to-date average price was up by 8.4 per cent to $567,198. The MLS(R) Home Price Index Composite Benchmark price for November was up by 7.7 per cent compared to a year earlier. TORONTO, December 4, 2014 - Toronto Real Estate Board President Paul Etherington announced that Greater Toronto REALTORS® reported 6,519 residential transactions through the TorontoMLS system in November 2014. The average selling price for November transactions was up by 7.4 per cent year-over-year to $577,936. The yearto-date average price was up by 8.4 per cent to $567,198. The MLS(R) Home Price Index Composite Benchmark price for November was up by 7.7 per cent compared to a year earlier. The Bank of Canada made their interest rate announcement and once again they maintain their overnight rate at 1%. The interest rate has been unchanged since September 2010 adding to the longest period of no change in the interest rate in history. This means the prime rate to consumers remains unchanged at 3.00%. My prediction is now for mid 2016 before we will see an increase in the rate of 3% Many are saying longer. It's been over 4 years since the rate was pinned at 1% and the trend appears to be continuing. Inflation in Canada is close to the 2 per cent target. Core inflation rose more rapidly than was expected in the Bank’s July Monetary Policy Report (MPR), mainly reflecting unexpected sector-specific factors. Total CPI inflation is evolving broadly as expected, as the pickup in core inflation was largely offset by lower energy prices. Underlying inflationary pressures are muted, given the persistent slack in the economy and the continued effects of competition in the retail sector. Although the outlook remains for stronger momentum in the global economy in 2015 and 2016, the profile is weaker than in July and growth prospects are diverging across regions. Persistent headwinds continue to buffet most economies and growth remains reliant on exceptional policy stimulus. Against a background of ongoing geopolitical uncertainties and lower confidence, energy prices have declined and there has been a significant correction in global financial markets, resulting in lower government bond yields. Despite weakness elsewhere, the U.S. economy is gaining traction, particularly in sectors that are beneficial to Canada’s export prospects. The U.S. dollar has strengthened against other major currencies, including the Canadian dollar. In this context, Canada’s exports have begun to respond. However, business investment remains weak. Meanwhile, the housing market and consumer spending are showing renewed vigour and auto sales have reached record highs, all fuelled by very low borrowing rates. The lower terms of trade will have a tempering effect on income. Canada’s real GDP growth is projected to average close to 2 1/2 per cent over the next year before slowing gradually to 2 per cent by the end of 2016, roughly the estimated growth rate of potential output. As global headwinds recede, confidence in the sustainability of domestic and global demand should improve and business investment should pick up. Together with a moderation in the growth of household spending, this is expected to gradually return Canada’s economy to a more balanced growth path. As the economy reaches its full capacity in the second half of 2016, both core and total CPI inflation are projected to be about 2 per cent on a sustained basis. Weighing all of these factors, the Bank judges that the risks to its inflation projection are roughly balanced. Meanwhile, the financial stability risks associated with household imbalances are edging higher. Overall, the balance of risks falls within the zone for which the current stance of monetary policy is appropriate and therefore the target for the overnight rate remains at 1 per cent. Are Mortgage Interest Rates going up to down and should you buy hold and sell investment real estate? I received an email from a reader and thought I would share the question and my answer with you. Thanks for keeping the data up to date. Lots of good data on it. Question. Do u think with interest rates going up possibly mid 2015. This will cause a correction in pricing. What is your opinion on the over value of canadas house pricing. Some forecasters saying 20% drop in pricing. Are you currently on the Buy, hold, or sell model for investment property? You are asking very good questions. Unfortunately, nobody can predict the future but these are my thoughts and opinion. 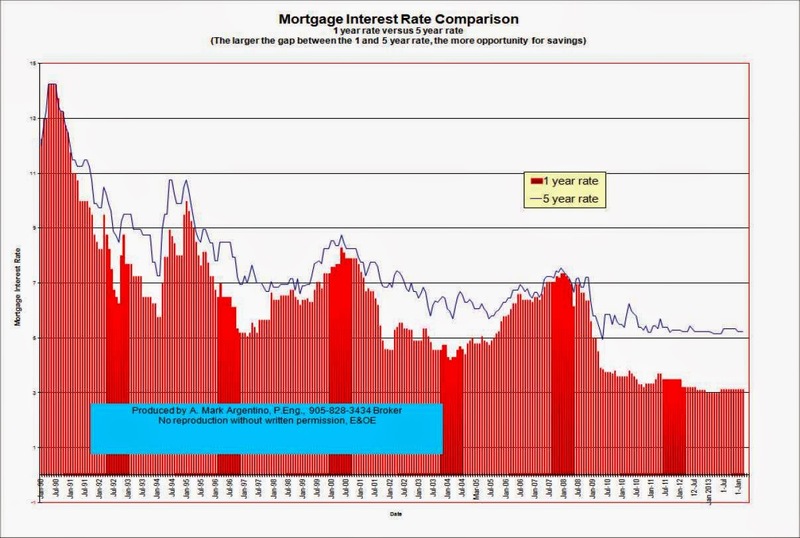 I can see the prime rate rising to 3.25 and maybe 3.5% by the end of next year, at the earliest. Even if/when this happens, the banks will raise their rates only slightly, I don't see them keeping in step with the Bank of Canada Rate. Rates will only rise to keep inflation in check. I don't think that rates will cause a correction in pricing. Yes, slightly fewer people will be able to enter the real estate market due to a price increase, but I don't feel this will have a large impact on our resale market. I believe that it will be some other event or combination of events that will cause our real estate market to have a correction. Our rise in prices has been unprecedented and nearly constantly upward since 1995. Logic says this cannot continue forever. Eventually the market increase in prices will slow and possibly retreat. When this will happen is anyone's guess. My opinion is that we will have a gradual slowdown of the market prices in late 2015 and into 2016, maybe only a 2 or 3% increase over that period rather compared to previous year over year increases of 4 to 10% You have to compare figures from the same period previous year as prices fluctuate during the year and you need to watch the month over month trend to get a handle on real estate prices. Year over year increases are what I am referring to. Our real estate market, similar to the stock market, can have a major correction in a very short period of time. Our TSX stock market has dropped (corrected - good grief I don't like that word, as it's a drop/loss/fall, not really a correction) nearly 10% since the high in mid September. In a similar way, if buyers stop paying the prices that sellers are asking and the real estate market softens then we can easily have a correction in the average price of 10% or $60,000 on the current average price of nearly $600,000 It would take about 2 to 4 months for this correction to happen. I am always of the mindset to buy and hold for the longer term, at least 5 years and more like 10 to 20 or longer. Buy real estate, hold, reduce original amortization to 20 years, use bi-weekly accelerated payments, pay yourself by making up the $100 to $300 per month shortfall with your savings and let the tenants pay off your investment properties in 15 to 20 years. Then you can enjoy the income in your later years. TORONTO, October 3, 2014 – Toronto Real Estate Board President Paul Etherington announced that there were 8,051 transactions reported through the TorontoMLS system in September 2014. This result represented a 10.9 per cent increase compared to September 2013. On a year-to-date basis through the first three quarters of the year, sales were up by 6.9 per cent annually to 73,465. "Despite a persistent shortage of listings in some market segments, we have experienced strong growth in sales though the first nine months of 2014. This is evidence that GTA households remain upbeat about purchasing a home. The majority of home buyers purchase a home using a mortgage. The share of the average household's income dedicated to their mortgage payment remains affordable, which is why buyer interest has remained solid," said Mr. Etherington. The average selling price for September 2014 transactions was $573,676 – up by 7.7 per cent compared to the same period in 2013. Average year-over-year price growth was strongest in the City of Toronto, both for low-rise home types like detached and semidetached houses and for condominium apartments. The average selling price year-todate was $563,813 – up 8.5 per cent compared to the first nine months of 2013. "If the current pace of sales growth remains in place, we could be flirting with a new record for residential sales reported by TREB Members this year. On the pricing front, the multitude of willing buyers in the marketplace coupled with the short supply of listings will continue to translate into very strong annual rates of price growth in the fourth quarter," said Jason Mercer, TREB's Director of Market Analysis. TORONTO, September 4, 2014 – Toronto Real Estate Board President Paul Etherington reported 7,600 sales through the TorontoMLS system in August 2014. This result was up by 2.8 per cent compared to 7,391 transactions reported in August 2013. Year-to-date sales through the end of August amounted to 65,454, which represented an increase of 6.5 per cent compared to the same period in 2013.
home types in August suggests that first-time buyers and existing home owners remain very active in today’s marketplace,” said Mr. Etherington. The average selling price in August 2014 was $546,303 – up 8.9 per cent in comparison to the average of $501,677 reported in August 2013. The year-to-date average price through August was $562,504, which represented an increase of 8.5 per cent in comparison to the same period in 2013.
continues to outstrip listings growth, the average selling price should continue to increase on a year-overyear basis,” said Jason Mercer, TREB’s Director of Market Analysis. result was up by 2.8 per cent compared to 7,391 transactions reported in August 2013. Year-to-date sales through the end of August amounted to 65,454, which represented an increase of 6.5 per cent compared to the same period in 2013. “The last full month of summer ended on a high note. As we look toward the fall market, I expect that demand for ownership housing will remain strong. Home buyers will continue to benefit from a diversity of affordable home ownership opportunities throughout the GTA. The fact that sales were up for all major home types in August suggests that first-time buyers and existing home owners remain very active in today’s marketplace,” said Mr. Etherington. The average selling price in August 2014 was $546,303 – up 8.9 per cent in comparison to the average of $501,677 reported in August 2013. The year-to-date average price through August was $562,504, which represented an increase of 8.5 per cent in comparison to the same period in 2013. “The number of listings in August was down in comparison to last year, while the number of sales increased. This means that sellers’ market conditions remained in place with a lot of competition between buyers. This is why we continued to see strong price growth last month. Looking forward, if sales growth continues to outstrip listings growth, the average selling price should continue to increase on a year-over-year basis,” said Jason Mercer, TREB’s Director of Market Analysis. Inflation is close to the 2 per cent target and is evolving as the Bank anticipated in its July Monetary Policy Report (MPR). Recent data reinforce the Bank’s view that the earlier pickup in inflation was attributable to the temporary effects of higher energy prices, exchange rate pass-through, and other sector-specific factors rather than to any change in domestic economic fundamentals.